The club takes its name from the nearby covered bridge which dates back to the Colonial era. While Jacob Bull built it to provide access to his grist and sawmill, the bridge reportedly offered passage to George Washington on four occasions during the Revolutionary War. Centuries later, the popular tourist attraction still remains active to car traffic spanning the Housatonic River just a few miles from the club. It is often said that a golf course is only as good as the land on which it is built. Without question, the nearly 400 acres in South Kent, CT offer a magnificent setting. The club chose Tom Fazio to transform the land’s natural beauty into an equally inspiring golf course. Tom quickly fell in love with the geography and commented, "This is an outstanding piece of land for golf in a setting that is nothing short of spectacular. 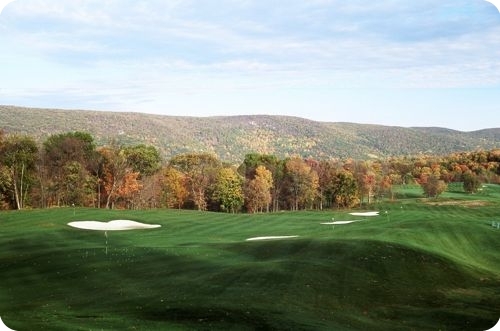 As a designer, it’s what you hope and dream for in a project.” Bull’s Bridge was the first and remains Tom’s only designed course in Connecticut. With the many Top 100 courses already to his credit, Bull’s Bridge has quickly risen to the upper echelon of Tom Fazio’s prolific portfolio. The course purposefully meanders throughout the wooded property making virtually every hole an experience unto itself. And with land conservation easements restricting residential activity, the views throughout the course will remain forever pristine. The property’s rugged elevation changes are effectively incorporated into the layout, sometimes subtly and other times dramatically. The sweeping fairways, a Fazio trademark, are often framed by distinctively sculptured white sand bunkers. Wonderful New England style stone walls weave throughout the course creating charm and challenge. Of all the course’s unique characteristics, the greens are quite possibly the most outstanding feature, gaining notoriety as some of the finest in the state. The artfully constructed contours and the purest of putting surfaces create a challenging yet enjoyable putting experience. The round begins high atop the property, and the par-five first hole immediately showcases so many of the course’s special features. It heralds what players can expect throughout the round. Most players choose to ride, but an active caddie program is in place for those who enjoy the walk. The practice facility is the perfect complement to the golf course offering the ideal location for warm-ups and tune-ups. Whether a novice or scratch golfer, the 400 yard area allows players of various skill levels to work on all aspects of their games. Using six fully bunkered greens as targets, practice shots closely simulate the shot-making that is required on the course. A three tiered grass teeing ground as well as a turf tee allow practice in any weather. Unique features include fairway bunkers and an uneven lies teeing ground to practice those tricky situations. A practice putting green situated near the first tee offers players an accurate sense of the smooth, speedy pace of the greens before it counts out on the course. 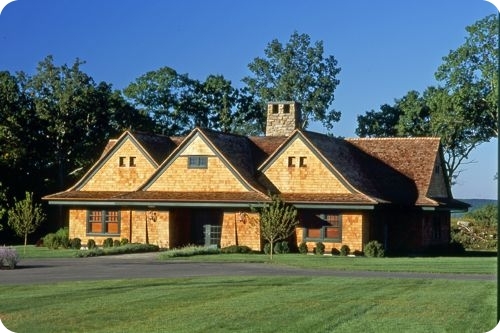 A cottage-style clubhouse offers complete amenities to the club’s members and guests. The spacious facility currently houses both men’s and women’s locker rooms as well as the golf shop and a full-service kitchen. The centerpiece of the building is the great room with a beautiful oak bar and a captivating stone fireplace. The space offers gathering and dining areas both inside and outside on the covered terrace and back patio. Breakfast, lunch and special occasion dinners are served at the clubhouse, while an on-course halfway house provides refreshments and a comfort station to players during the round.